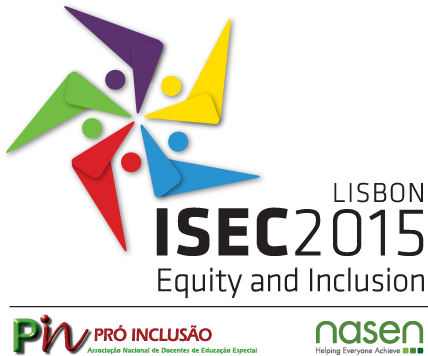 Pro-INCLUSION/Portugal and NASEN/UK invites all authors of accepted abstracts to submit full papers to included as part of an oline publication of proceedings for the 8th Inclusive and Supportive Education Congress – ISEC2015 Lisbon: Equity and Inclusion in Education. Please ensure that you follow all of the guidelines regarding full paper submission. If you have any difficulty submitting your full paper online, please contact the Organising Committee. ü Please read all guidelines carefully and follow the prompts provided in this document. ü Full papers that do not meet stated guidelines will be returned to their authors, for amendment. 1. International, national and local policies promoting equity and inclusion. 2. School organization, curriculum and evaluation for equity and inclusion. 3. Innovative approaches to promote education for all. 4. Contributions of virtual, digital, assistive technologies and educational resources to equity and inclusion. 5. Teacher and professional development. 6. Equity and inclusion outside the school's walls. 7. Building Future Education: inertias and innovations. ü Full papers can be written both in English and Portuguese. ü Any style of edition is accepted (APA, ABNT, Vancouver and others). However, the paper must be coherent, always keeping the same style throughout the text. ü Papers that promote commercially available products, services or programs, will not be published. ü Papers already published or submitted for publication elsewhere will not be accepted. ü Full papers must be submitted in Word format (.doc ou .docx), by the online form. ü Full papers must be submitted by the deadline of June 7, 2015. - File type: Word (.doc ou .docx). - File title: save the file with the SURNAME_Name of the 1st author, followed by the paper title. - Remove spaces before and after paragraphs. - Edition style: APA, ABNT, Vancouver and others, however, always keeping the same style throughout the paper. Þ For symposiums: up to 150 words for the general abstract of the symposium. Up to 700 words for the specific paper of each author (including its respective subtitle, abstract, bibliographic references and appendix). - TITLE IN ALL CAPS and bold. - SURNAME IN UPPER CASE, first names in lower case. Affiliation. Funding agency (if any). Contact (e-mail). - Keywords: 3-5, separated by commas. CARVALHO, Ana Maria Silva. Pro-Inclusion: National Association of Special Education Teachers. Funding agency: INJJ. (anamariascarvalho@domain.com). - Abstract: up to 150 words (general abstract of the symposium). - Keywords: 3 to 5, separated by commas. - Subtitle of the first author in lower case and bold. - Up to 700 words, between the subtitle and the bibliographic references or attachments (if any). - Subtitle of the second author in lower case and bold. RUAS, José António. Meninos de Sempre Foundation. Funding agency: CNPAPC. (josearuas@domain.com ). 2. Policies of special and inclusive education in Brazil. RESENDE, Marilise dos Santos. State University Maria do Rosário. Funding agency: UEMR. (marilisesresende@domain.com.br ). (Note: Up to 150 words for the general summary of the symposium. Up to 700 words for the specific text of each author, including its respective subtitle, abstract, bibliographic references and appendix - if any). a) save the file with the SURNAME_Name of the 1st author, followed by the paper title. b) Submit file here (Word format - maximum 5MB), up to 7 June 2015. If you have any difficulty submitting your full paper online, please contact the ISEC2015Lisbon Organising Committee. The inclusion of the full paper documents online implies the registrations and payment to attend the Congress byn June 7, 2015. To ensure the quality and equal participation for all presenters payment of the registration fee is mandatory for all participants, including those who will coordinate, present or attend a presentarion meeting. Click here for access to all the information for authors of ISEC2015 Lisbon. Enrollment in the congress assumes the agreement that those registered authorize ISEC2015 Lisbon to share images of the congress (photos and videos), and to disclose the link to download the online publication of proceedings, containing data of the authors as: name, institution, country, e-mail, text and others. The ISEC2015 Lisbon Programme Chair, Professor David Rodrigues, the Organising Committee Chairs, Luzia Mara Lima-Rodrigues, Ph.D. and Nelson Santos, M.A., along with all the Organising Committee are waiting in Lisbon. If you have any doubt, question or suggestion, please contact us.